Being Batman is hard work. It requires billions of dollars in your checking account, a giant mansion that’s built on top of a cave that can be used as a base of operations and many years of martial arts training. You also need a butler, an acrobat sidekick with the same passion for justice that you have and a really cool car. Well, chances are pretty good that you’re not a socialite with a tragic backstory and a multi-billion dollar bankroll, so being Batman might not always be easy. The good news is that we can help you be Batman! 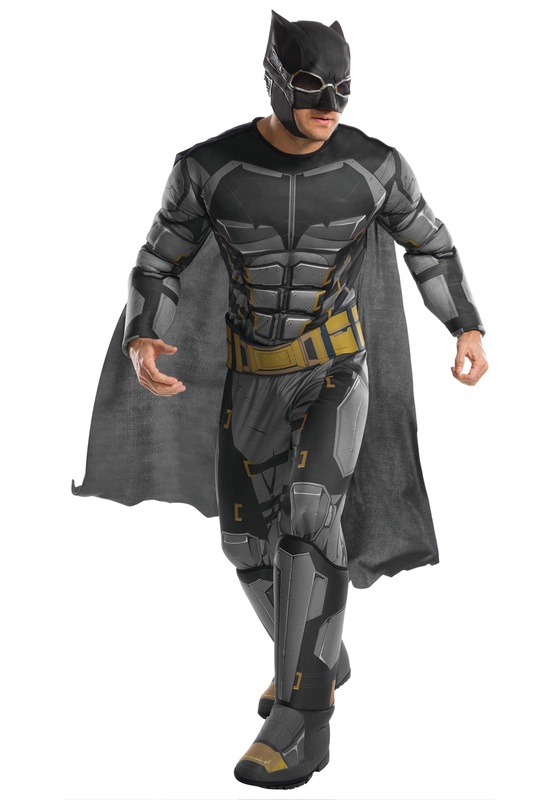 Just wear this Deluxe Tactical Batman costume, which is based on the Justice League movie, and you’ll be halfway there to becoming the iconic DC hero. This adult Batman costume comes with everything you need to start your transformation into Bruce Wayne’s alter ego. It comes with a full jumpsuit that has muscle padding in the chest and arms, along with printed armor detailing. Attached boot covers and gauntlets help complete the look, making you look like a fully outfitted superhero with a hefty bankroll! Of course, it also comes with a belt and cape, as well as a Batman mask to hide your secret identity from the likes of The Joker and his goons. The only thing you’ll need to “be Batman” is some deadly gadgets and a lifetime of martial arts training. You’d better start working on both of those details while you wait for the costume to arrive at your doorstep!